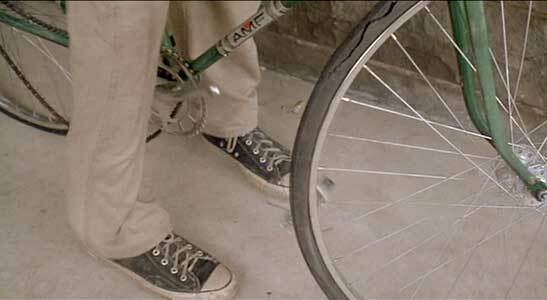 Daniel Stern and Jackie Earle Haley wear black high top and maroon low cut Converse “Chuck Taylor” All Stars in the film. 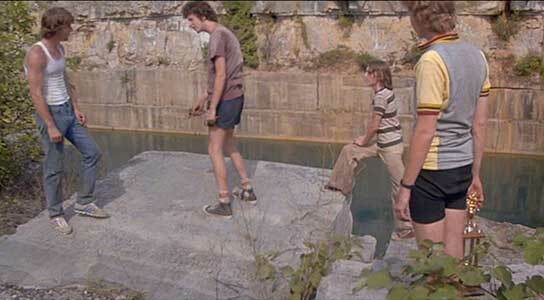 The four “Cutters”, Mike, Cyril, Moocher, and Dave go swimming at the abandoned quarry. Dave Stoller (Dennis Christopher) has recently graduated from high school but hasn’t decided what he is going to do for the rest of his life. Instead of going to college or getting a job, he and his three buddies, Mike (Dennis Quaid), Cyril (Daniel Stern) and Moocher (Jackie Earle Haley), have decided to spend the year hanging out and having a good time. Dave’s one passion though is bicycle racing, and he is very good at it, winning local trophies pretty much at will. He greatly admires the Italian racing team, considered the best in the world, and spends all of his time emulating them. He listens to Puccini and Verdi, practices learning the language and speaks with a pseudo-Italian accent, wants to eat Italian food, and one day shaves his legs to cut down wind resistance because he read that the Italian team members shave theirs. 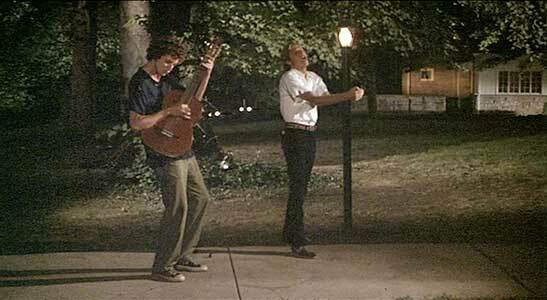 He even pretends to be an Italian exchange student when he meets a college girl, Katherine (Robyn Douglass), and continues the pretense by going to serenade her continental style at her sorority house. Dave’s lack of motivation toward doing anything practical, and his Italian affectations are driving his father (Paul Dooley) crazy. However, his mother (Barbara Barrie) likes this new culture that Dave has brought into their rather mundane lives in Bloomington, Indiana. There is a great scene of cutaways between Dave and Cyril serenading Katherine and Dave’s mom and dad having a romantic evening at home. The soundtrack also cuts away between Dave’s live performance and his Italian recording of the same song that his mom is playing to set the proper mood at home. Dave’s mom shows his dad his latest bicycling trophy. In addition to the main plot about bicycle racing, Breaking Away deals with the hostility between the college fraternity students at Indiana University and the locals, who are called “cutters” (In the early days of Bloomington, stone cutting at the local quarry was the main source of employment.) For instance, Mike dislikes the fraternity students because they are from wealthy backgrounds, actively discourage mixing with the locals, and feel that they own the town. He is also jealous of the fact that they still are involved in sports (he was a high school quarterback), and seem to have a future, while he is frustrated by his own lack of ambition and wants to retaliate against any real or perceived slight by them. Dave’s dad, since he lost his job at the quarry, runs a used car business, and takes great delight in passing off a lemon to a university student. Things come to a head when a group of fraternity guys, tipped off by sorority girl that some “outsiders” are serenading Katherine, come barreling over to the sorority house, chase after Cyril, who was only the guitar accompaniment, and beat him up. (Dave had already left with Katherine.) This throws Mike into a rage, and he tracks down the fraternity students and engineers a destructive fight at a local bowling alley between them. When the university administration hears about what has been going on, they are appalled, and to try and smooth things over, they offer to let locals enter the school’s 500 lap bicycle race, so that the two sides can channel their competition to a more constructive venue. Cyril and Dave serenade Katherine. 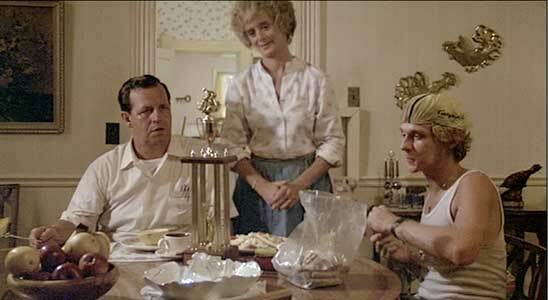 Breaking Away won the Academy Award for Best Screenplay, and one of the best features of this film is its realistic depiction of each character. Although on first glance it appears to be just another “coming of age” story, Breaking Away has many more layers of meaning woven into its script. These topics include people’s feeling about college, the generation gap, class consciousness between rich students and poorer townspeople, ethics in professional and amateur sports, and what the four “cutter” boys try to do about the direction of their lives. Although the four buddies had agreed to continue their strong childhood friendship and hang out together for a few years, the harsh realities of the real world threaten to break this up. The diminutive Moocher asserts his masculinity by planning to getting married and moving to Chicago to seek a job like his father (a former stone cutter) already has. Cyril, portrayed as a nice guy conditioned to fail by his father, plans to retake the college entrance exams although there is little hope for a basketball scholarship. Mike’s pent-up anger threatens to get him into trouble, and only the intervention of his police officer brother keeps him out of additional trouble and in line. And Dave even seeks a job at his father’s used car lot when he becomes disillusioned with bicycle racing after being treated unfairly by the Italian team during an exhibition race in Bloomington. Moocher, Dave, and Mike at the quarry. Cyril checks out the bicycle that the Cutters will use in the local race against the fraternities. Both Cyril and Moocher wear chucks throughout the film, with Cyril, the ex-basketball player wearing black high tops, and Moocher wearing maroon low cuts. 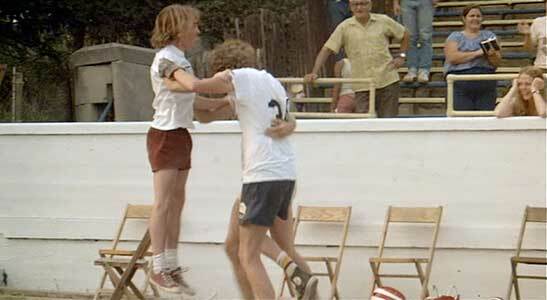 The best scenes involving Moocher are at the relay race. The best scene involving Cyril is when he checks out the bicycle that the cutters team is supposed to use during the 500 lap race. The Cutters celebrate their last second victory in the race. Breaking Away. (1979) Dennis Christopher, Daniel Stern, Jackie Earle Haley, Dennis Quaid, Barbara Barrie, Paul Dooley. Directed by Peter Yates. Categories: Drama, Coming of Age, Sports.